Such measured, unifying, moderate words from the same man who also remarked of his political rivals, the Federalists and Monarchists, “Their leaders are a hospital of incurables and as such are entitled to be protected and taken care of as other insane persons are.” Sounds like big government socialism to me! Taking care of the insane, indeed! 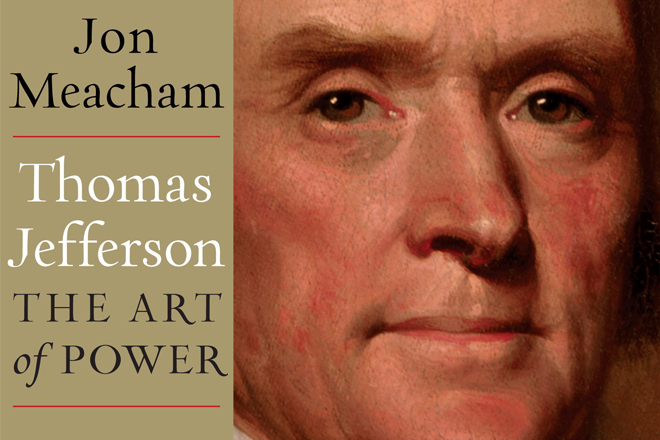 These are but a few of the engaging, enlightening, entertaining, astounding words taken straight from Jefferson in Jon Meacham’s masterful biography, Thomas Jefferson: The Art of Power. I swear to god by the end of this magnificent tome where Meacham describes Jefferson’s granddaughter in a dreamlike state wandering the vast empty rooms of Monticello following her grandfather’s death, I too was swept up in an all encompassing reverie where Terrence Malick was directing the story of Jefferson’s life and the images from Jefferson’s earliest memory of being lifted upon a pillow to a slave on horseback to his final moments with yet another slave dedicated at his bedside – all of his life – flashed before me in a cacophonous stream-of-consciousness scored by Micheal Nyman. This biography is that intimate…that transportive…full of excerpts from letters, diaries, reports both second and first hand from those closest to him, from family and friends, from foreign diplomats, from rivals and scoundrels, even from his own slaves. There was nobody at the time who wasn’t talking and writing about him, and these gifts to future generations are woven by Meacham into a tapestry of astonishing power that makes you feel as if you could’ve been there right next to the man…the philosopher…the farmer…the author…the diplomat…the lover of life (and things and women)…the president…the man who more than anyone shaped this nation in its most shaky and fleeting predawn light. Cue Malick’s camera turned upwards towards sunlight filtered through trees upon Monticello. Yet Meacham makes it clear Jefferson was no saint…no perfect man. He wielded power to shape the world as he saw fit. He was guided by a principle that man should govern himself and that a union should be formed around that principal and needed to survive at all costs…but he was full of doubts (both about himself and the republic he helped form) and contradictions. Philosophically he knew slavery was wrong, but he didn’t let that stop him from enjoying the benefits of owning slaves and he deferred the solving of this great problem to future generations, as being a Virginian and a politician he knew it was just too hot of a topic to balance the fate of a young delicate union on at the time (remember that in his day it was the New England states threatening secession as they favored a model of government closer to England’s with a monarch). He felt freeing the slaves was the necessary course of action…but not now…and he also felt that freed blacks would never be able to co-habitate peacefully with whites in the same nation, so the matter of colonization or shipping them back to Africa would need to be addressed. Yet he fathered children with his slave Sally Hemmings (the younger half-sister of his dead wife! ), and there was a long history of “co-habitation” on Southern plantations. Alas, as was his will at the time of his death, only the slaves related to Sally were freed. 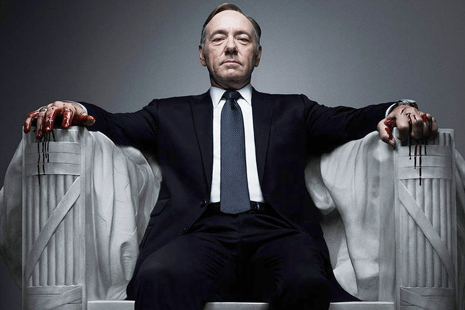 Kevin Spacey tries to build his own monument in HOUSE OF CARDS. While reading The Art of Power, I also ravenously devoured the 13-episodes of Netflix’s trailblazing original series House of Cards, an Americanized version of a classic British miniseries, co-produced by David Fincher and starring Kevin Spacey as a Machiavellian House Majority Whip from South Carolina named Frank Underwood. Part of the appeal of House of Cards is its intimate look at political maneuvering by a man who breaks down the 4th wall and talks straight to the audience while keeping his best cards close to his chest. It wasn’t clear early on what was Underwood’s end game (it is made crystal clear by the end of the season). He seemed to wield power through manipulation for the sheer egotistical joy of it. He simply loved the game. His wife (Robin Wright) seemed equally at home trading favors, though her oversight of a non-profit clean-water project seemed at least noble in concept. Who cares about the means to an end as long as the end is just, right? There was also an air of familiarity and plausibility in the early episodes. This Washington seemed real. When Underwood went back home to Gaffney in the third episode to deal with a scandal involving a giant peach off I85, I knew that famous landmark peach well (and have dined at the Aunt Sarah’s Pancake House underneath it) from my days living near the North and South Carolina border in Charlotte. When Underwood chose Congressman Russo (Corey Stoll) to become the next cog in his wheel, Russo’s scandalous personal life and back story of being a blue-collar kid from the harsh streets of Philadelphia rang true to this New Jerseyan living right over the Delaware River from Philly. I fear though in its final episodes House of Cards may have overplayed its hand and already “jumped the shark” as Underwood’s “disposal” of a certain player (NO! NOT RUSSO!) strained credulity, and the fascinating character of his wife was disserviced by a new clichéd plotline where it turns out all she ever really wanted was children, which left me saddened. Say it ain’t so! Can’t a woman crave power for power’s sake in this day and age? But the best thing about both Meacham’s Jefferson biography and Spacey’s devilish Congressman Underwood is that they both made me look at current politics in a different way. In the midst of being fully engaged in both of these was the grand theater of Barack Obama’s State of the Union Address. I couldn’t help but think back to Obama’s past statements that rang Jeffersonian (i.e. “There are no red states and blue states, there is only one United States!”), the vitriol of the radicals from both sides, and the moderate (and Jeffersonian) way in which he has thus far governed while campaigning for bipartisanship but at the same time laying out progressive agendas that speak to the base but will never gain traction. Obama has tried to have it all ways, but unlike Jefferson, he doesn’t have a Louisiana Purchase up his sleeve. I also couldn’t help but wonder, too, was there a real-life Frank Underwood plotting in the background? I could almost see Kevin Spacey standing in the back…in the shadows…smiling. What would Thomas Jefferson think of Barack Obama – a man of mixed-race sitting in the highest office? Would he even believe it? Would he be glad to know that future generations rose above what he even thought possible and that while politics really haven’t changed a bit in their manipulations, the state of the union is still strong? Would he see in him a man who carried on his legacy like Madison and Monroe or would he see someone stretching too far the power of the executive branch? What would Thomas Jefferson think of a politician like Frank Underwood? Would he use a man like that to his own advantage…or would he see him like he (at times, depending on the direction of the winds) saw the villains of his life’s play…the Alexander Hamiltons…the Aaron Burrs? Would an Underwood be considered dangerous or admired…or both? With much careful thought, he might think of both Obama and Underwood in similar fashions…as incurables…and as such entitled to be protected and taken care of as other insane persons are. And that’s the beauty of the nation Jefferson helped create…a nation that can survive constant political maneuvering between warring sides and still stand…a nation that can survive threats internal and external…a nation that can wage war and thrive in peacetime…a nation that bends not to the whims of the fringes but to the reason of the majority. There’s room in this nation for Obama and Boehner, for bleeding heart liberals and insane Tea Partiers…and for people like Underwood (whether they are fictional or not)…and I think that’s just how Jefferson would’ve wanted it. This entry was posted in Book Reviews, Books, History, Inspiration, Politics, Television and tagged Barack Obama, Biographies, Corey Stoll, David Fincher, Frank Underwood, House of Cards, Jon Meacham, Kevin Spacey, Netflix, Presidents, Robin Wright, State of the Union, The Art of Power, Thomas Jefferson.